Entrance: Comes with a little bird on his hand. The bird flies away. Victory: Jumps and stands on his arm smiling, then jumps, returning to “normal”. Defeat: Falls on his knees and hides his face with his hands. Victor, Hugo and Laverne throw 14 stones at the enemy team. Each stone deals X damage. Stones deal 25% more damage to burning foes. The Notre Dame bells ring, silencing enemies for 7 seconds. Silence can fail against enemies level 21 and higher. Once per battle, when one of Quasimodo’s allies gets KOd, he resurrects him/her, granting Y HP. If this ally has max HP less than Y, he/she gets max HP. 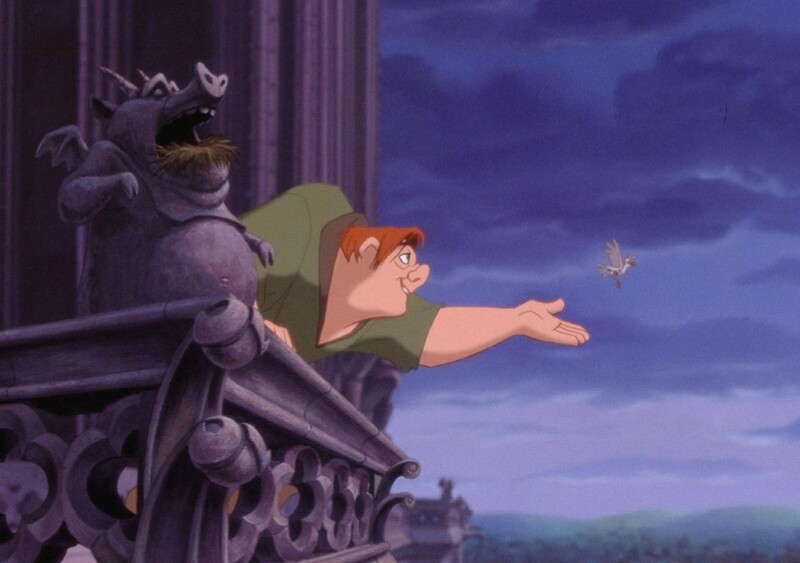 Quasimodo can’t resurrect himself. Quasimodo gains Z bonus armor for each ally standing. He loses the bonus when his allies get KOd. Charmed enemies don’t give the bonus. Entrance: Comes at the battlefield dancing. Victory: Gets a tambourine and plays it. Defeat: Blows her nose. If upgraded to Purple, releases a cloud. Esmeralda dances, giving X HP to one ally with the lowest HP left. All other allies get 250 Energy. Djali runs at Elmeralda’s foes and hits them 3 times. Each hit deals Y damage. Esmeralda charmes an enemy with the lowest reality for 6 seconds. Have a chance to fail against enemies level 21 and higher. When KOd, Elmeralda releases a “magic” cloud, blinding enemies for 4 seconds. Blinding can fail against enemies level 41 and higher. Entrance: Comes at the battlefield and gets his dagger. Victory: Looks at his dagger smiling viciously. Defeat: Drops the dagger and falls on his knees. Frollo lights a torch and throws it at the enemy team. All enemies are dealt X damage over 5 seconds. Frollo uses his cape to blind the closest opponent for 8 seconds. Enemies level 21 or higher get blinded for 3 seconds. Frollo makes the closest enemy fight on his side for 5 seconds. This skill has a 50% failure chance. If it fails, the enemy gets Y damage for 2 seconds. Frollo’s team’s attacks over time deal Z more damage per second. I’m also thinking of disks for these characters. Quasimodo’s “Sanctuary” also gives 1(+1 per star) second of invincibility to the revived ally. Disk levels give bonus armor. Quasimodo now has 20%(+20% per star) chance to avoid silencing. Disk levels increase the amount of health he heals after avoiding it. When Esmeralda’s “God help the outcasts” heals an ally with the lowest HP, all other allies get 10%(+10% per star) HP from that heal. Disk levels increase reality. Esmeralda’s allies heal each time they attack a stunned/blinded/silenced opponent. They can maximum heal 15%(+15% per star) HP each wave, after that they stop healing. Disk levels increase heal per strike. Frollo now has a 20%(+20% per star) chance to scare a burning opponent with his basic attacks. Disk levels increase basic damage. When Frollo’s “Be mine or you will burn” works, the charmed opponent receives 20%(+20% per star) basic attack bonus. Disk levels increase Frollo’s HP. Now I find it unfair. I should include one more. Entrance: Crawls, hiding his face under a red cape, then reveals himself. Basic attack: Throws a little burning stick at the enemy. Victory: Gets the puppet and laughs with it. 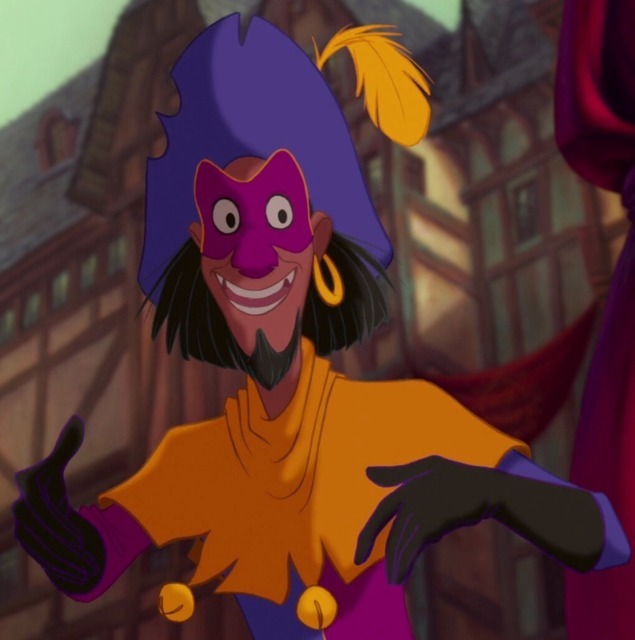 Clopin puts a “Fooled” effect on all enemies for 3 seconds. When a “Fooled” character uses white skill, he/she deals no damage and heals no HP. “Fooled” may fail against enemies above level 1. Clopin plays with a puppet, confusing enemies, silencing them for 8 seconds and stunning for 2 seconds. Both effects may fail against enemies above level 21. Clopin dresses like Frollo and taps several times with a hammer, dealing X true damage to an enemy who has X or less HP. All other enemies get scaried for 6 seconds. Scaring may fail against enemies above level 21. Clopin can use this skill once per wave. When Clopin damages a “Fooled” opponent, he deals 25% splash damage. He deals 10% splash damage when attacking a “Fooled” enemy above level 41. When using “Lawyers and judge all in one”, Clopin has a 20%(+20% per star) to KO two enemies(If there are two or more enemies with X HP or less). Disk levels increase basic damage. When a “Fooled” enemy tries to heal himself/herself, Clopin’s weakest ally gets 20%(+20% per star) of that HP(Of the amount that the enemy would get without being “Fooled”). Disk levels increase skill power.